Now that the trade deadline has passed, it’s time to look ahead to the final days of the NHL season. And that’s literally all there is left — we’re just 19 days away from the regular season wrapping up. In the coming weeks, there will be time to praise the Cup contenders and heap scorn on the washouts. But today, let’s spend some time with the NHL’s middle class — those teams fighting tooth and nail for a playoff spot. At the conclusion of Sunday night’s action, there were 10 teams within three points of eighth place in their conference. Here’s a look at those teams (and a few others), and how likely they are to still be standing when the first round begins. Current status: After becoming the league’s feel-good story in the face of devastating injuries, the #peskysens may finally be running out of gas. They’ve lost four straight, including Sunday’s 2-1 defeat to the lowly Panthers. Remaining schedule: Their 10 remaining games include five against teams that are currently outside the playoff picture, including their next three. But the Senators also have some tough matchups, including two against the red-hot Capitals, and one each against the Bruins and Penguins. And of course, they’ll have to deal with a brutally hostile crowd when they play their archrival Maple Leafs at home. The optimist’s view: Craig Anderson is back, Milan Michalek looks like he’ll be next, and even Jason Spezza hasn’t been completely ruled out. Maybe even more importantly, Ottawa banked enough points over the first two months that the teams chasing it will probably run out of time. The pessimist’s view: When you look at the Senators’ roster, there’s really no reason to think they should even be close to a playoff team. Of course, you could have been saying that all season long, and they’d have proven you wrong so far. Worth noting: As of today, Sports Club Stats estimates that the Sens have a healthy 93.8 percent chance of making the playoffs. But just over a week ago, that number was 99.75 percent. Current status: Amid all the talk about John Tortorella’s job security and the deal that exiled Marian Gaborik to Columbus, you could be forgiven for not noticing that the Rangers are sitting in a playoff spot today. Remaining schedule: Excellent. They have a pair against the Leafs this week before a showdown with the Islanders, but after that, they close out the year with seven straight against non-playoff teams. The optimist’s view: Despite the season’s constant drama, this is still a very good team that isn’t all that much different on paper from the squad that finished last year as the East’s no. 1 seed. The pessimist’s view: This situation still has a ticking-time-bomb feel to it. Is the next bump in the road the one that finally makes it all unravel for good? Worth noting: Since the turn of the century, the 2006-07 Sabres are the only reigning Eastern Conference top seed to miss the playoffs the next year. Current status: In between punch lines about their history of futility, decrepit arena, and bizarre collection of goaltenders, the Islanders have quietly sneaked into eighth place in the East. Remaining schedule: Pretty sweet, with six of their remaining nine games against teams that are currently out of the playoffs. The Islanders will end the year with a five-game road trip, but they’ve actually been much better away (11-5-2) than at home (8-11-2). The optimist’s view: The Islanders host the Rangers on Saturday in what could be the most important game at the Coliseum in years. If they win, they should be able to ride momentum and a soft schedule to a strong finish. 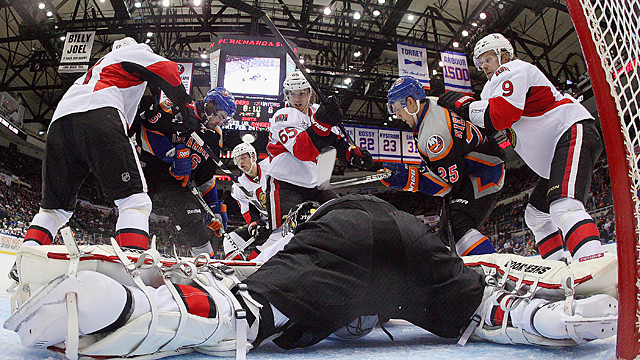 The pessimist’s view: They’re the Islanders. Something terrible is about to happen. Worth noting: The Islanders have made the playoffs only once since the 2005 lockout, and haven’t been out of the first round in 20 years. If you know that and you’re still rooting against them, you’re an objectively bad person. Current status: Hey, remember all those articles about what a disaster the Capitals were? They’ve won four straight and are currently the East’s third seed, thanks to owning the top spot in the Southeast Division. Oh, and Alexander Ovechkin is on fire. All those people who wanted to write him off a few weeks ago sure look dumb now, am I right? Remaining schedule: It’s tough, with a total of six games against the Northeast’s four playoff teams. A showdown with the Jets on April 23 could decide the division. The optimist’s view: It took them a while to warm up to new coach Adam Oates’s system, but now everyone is on the same page and they’re cruising. And Ovechkin has that “carry the whole team on his back” vibe going. The pessimist’s view: It’s hard to find one right now, other than worrying about what happens if they start feeling too good about themselves and take the foot off the gas pedal. Worth noting: Although the Jets would own the tiebreaker right now, the Caps still have a game in hand. Remaining schedule: Not pretty, with only two of nine games against teams that are below them in the standings. A pair of games against the Rangers in the final week (both in New York) could decide their fate. The optimist’s view: The road ahead looks like a tough one, but never bet against Martin Brodeur in a big game. The pessimist’s view: They can’t score (they’re last in the East in goals for), they’re lousy on the road (five wins in 20 games), and they still don’t know when Kovalchuk will be back. They’re done. Worth noting: The Devils have 15 wins and 24 losses, but are staying in the race thanks to a league-leading 10 loser points. Current status: Just a few weeks after it looked like everything was falling into place for a division title, the Jets have gone 3-7-0 in their last 10 and watched the Capitals sneak by. Remaining schedule: They play only one team that’s solidly locked into a playoff spot, and that’s a season-ending game against a Canadiens team that might not have much to play for. The April 23 game in Washington is huge. The optimist’s view: The Jets play their next five in Winnipeg in front of arguably the league’s loudest fans (even though they’re only a .500 team at home). The pessimist’s view: With just eight games left on the schedule, every other team in the conference has one or more games in hand. And did we mention the mounting pressure after they stood pat on deadline day? Worth noting: It’s still possible that the Jets or Capitals could win the Southeast and the third seed that goes with it, despite finishing ninth in the conference in terms of points. This is a really bad division. Current status: Just a week ago, the Wild looked like a good bet to win the Northwest. 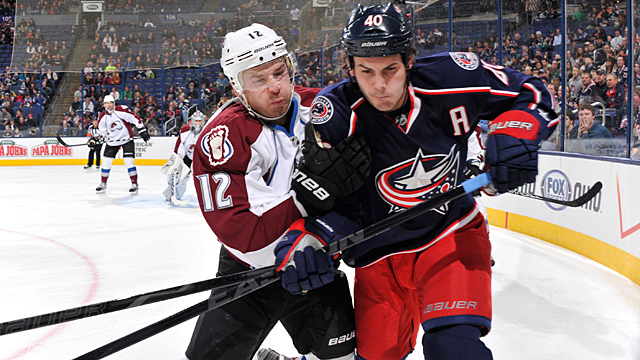 But three straight losses dropped them as low as seventh before Sunday’s win in Columbus. They did add one of the biggest prizes at the deadline in Jason Pominville, though the price was high. Remaining schedule: They have Chicago and St. Louis up next, but could finish strong. The optimist’s view: With the addition of Pominville, there’s just too much talent and too few games left for this team to collapse and fall all the way out of a playoff spot. The pessimist’s view: I could make something up, but … nah. They’re in. Worth noting: They’re still closer to the division title (just two points back of the Canucks) than they are to eighth place. Current status: After hitting a rough patch midseason, the Blues looked like their old selves Sunday, as a 1-0 win in Detroit moved them past the Red Wings and into seventh place. Remaining schedule: They play three on the road this week, then finish with seven of eight at home. Their final week could be a good one, as they’ve got Colorado twice, the Flames once, and then a season-ending game against a Blackhawks team that will likely have already clinched the top seed. The optimist’s view: The Blues are a better team than they’ve shown so far this season, and they made a significant improvement at the deadline with the addition of Jay Bouwmeester. The pessimist’s view: Jaroslav Halak’s recent injury is a concern, since his absence means the Blues have to rely on a rookie (Jake Allen) and a struggling veteran (Brian Elliott). Worth noting: The newly acquired Bouwmeester is in his 10th season, and has never been on a playoff team. Current status: The Red Wings seem to be running out of steam as the season draws to a close. 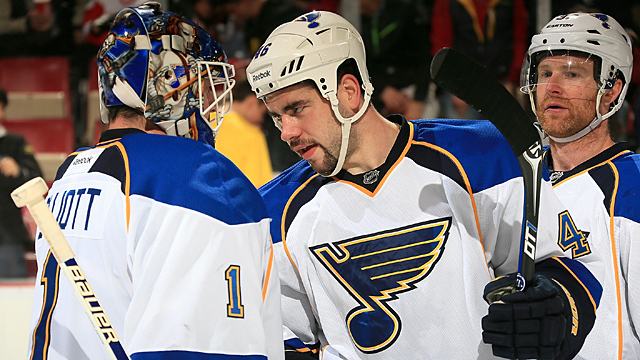 Sunday’s 1-0 loss to the Blues dropped them down to eighth place, and they’ve lost more games than they’ve won. Remaining schedule: Pretty much right down the middle. Four at home, five on the road. Four against playoff teams, five against non-playoff teams. The optimist’s view: They’ll figure it out, because they’re the Red Wings and they always do. The pessimist’s view: Ken Holland might have been on to something when he predicted before the season started that the Wings could miss the playoffs. Worth noting: The Red Wings have made the playoffs every season since 1990–91, by far the longest active streak in the league. Current status: After last season’s run to the conference finals, the Coyotes have been decidedly average this year. But a three-game winning streak has them back within striking distance of eighth place. Remaining schedule: It’s a mixed bag, including one game each against the conference’s best three teams (Chicago, Anaheim, and Vancouver) and the two worst (Calgary and Colorado), plus five with teams right around them in the standings. 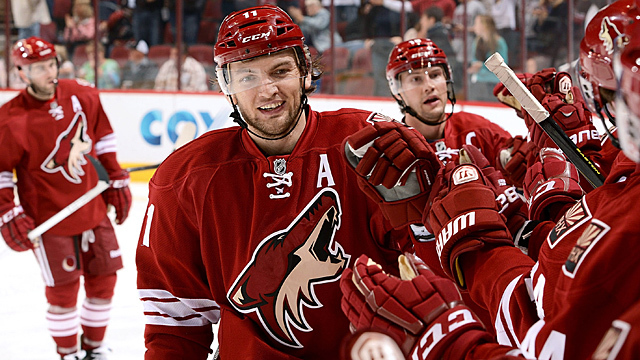 The optimist’s view: The Coyotes are getting hot at the right time, and with upcoming games against both the Blues and Red Wings, they at least partially control their own destiny. The pessimist’s view: Seven of their remaining 10 games are on the road, where they have only four wins all year. Plus, the ongoing ownership saga is on the verge of once again becoming a distraction. Worth noting: Three of last year’s four conference finalists are fighting for their playoff lives, with only the Kings looking like a sure bet. Current status: OK, technically the Oilers are four points back, but we’re going to make an exception for them because it’s not often you get a chance to talk about Edmonton and the playoffs. Remaining schedule: Ugly. They have three more games against the Ducks, and one each against the Canucks and Hawks. And they’ll be busy in the season’s final week, when they play five. The optimist’s view: The front office resisted the urge to sell at the deadline, so they obviously believe this team has a shot! The pessimist’s view: The front office doesn’t exactly have a track record of great judgment. Worth noting: This would be the Oilers’ first playoff appearance since their stunning run to the 2006 Stanley Cup finals. Current status: We’ll let the Blue Jackets in through the same loophole as the Oilers, especially since they’ve suddenly become one of the league’s best stories. Not only have they stuck around in the playoff race, but they also landed Gaborik at the trade deadline. Remaining schedule: What jumps out is an upcoming six-game road trip that starts Saturday. 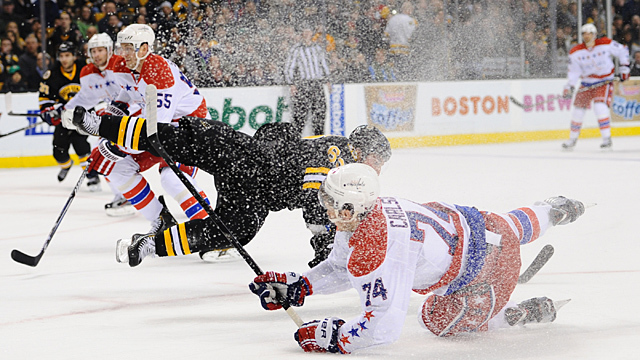 That’s bad news for a team that’s far better at home (11-5-5) than on the road (5-11-2). The optimist’s view: Every sports year seems to feature one team that comes out of nowhere and shocks the world. Why not the Blue Jackets? Why not now? The pessimist’s view: After Sunday’s loss to the Wild, the Blue Jackets are four points back and will have to leapfrog four teams. They’re getting dangerously close to “need to run the table” territory. Worth noting: This is the Blue Jackets’ 12th season in existence. They have never won a playoff game.